Penthouse with Pool and private Terrace. 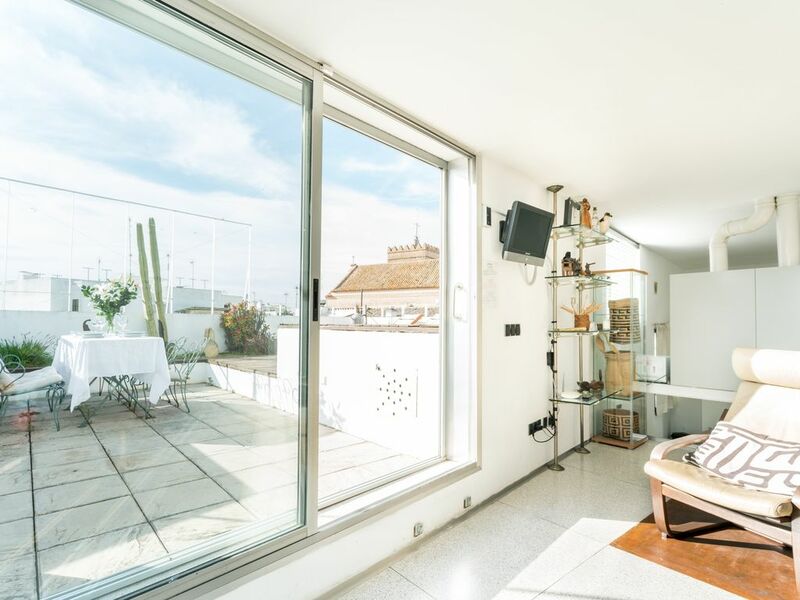 The two bedroom apartments with terraces is available for medium and long stays can be found at the apartment building ecological in the historic district of San Luis de Seville. The project retrieves a way of life based on internal recess, and there is a feeling of surprise, crossing the threshold of entering the main courtyard, garden and a pond with water. He was a finalist at the awards architectural FAD 2002. In the courtyard a structure of iron and aluminum, along with a free lift tower, serve as a nucleus of communication to homes. On this common courtyard garden with a pond and how much water. The second floor apartment is distributed into a large space to enter living room and kitchen, from which accesses the other rooms: two bedrooms, and the fourth bath. It has annexed a small terrace with outdoor furniture. The entire house is adjacent exterior with lights and ventilation. The simplicity of the materials used, the terrazzo floor on the spot, wood bathroom, etc.. Serve as to the few furniture or objects chosen so vegetative. The apartment is equipped with cooking utensils and full regalia. The neighborhood of San Luis is located near the intramural arch of the Macarena, and remains almost intact its urban fabric Arabic. Historically has been the working class district of Seville, known more for San Julian, where even today there are pockets of active citizens movements in the famous square of El Pumarejo. The Pumarejo Square and its environs has become a hotbed of cultural vanguard in the city. - Pour les réservations de plus de 28 nuits, les fournitures d'électricité et de gaz et d'eau, ils ne sont pas inclus, payable au départ. The view of the church from the roof deck is spectacular. In warm weather, the small pool on the deck must be wonderful. The roomy apartment is in a quiet neighborhood but in close walking distance to all of the sights. There are good restaurants and food stores in short walking distance. I enjoyed a meal at Contenedor which is a 2 minute walk from the apartment. Make sure to make reservations online or you will never get in. Well positioned and appointed apartment. Beautifully quiet but only a short walkable distance from the more touristy parts of Seville. Loved the rooftop terrace and pool. Very comfortable stay. We are pleased to host you. This was a very nice apartment with everything we needed for the 4 of us. We also loved going onto the terrace to enjoy the view. Jorge recommended some spots for dinner and drinks which were great, we loved them! We had an amazing dinner at conTenedor, which is right by this apartment. In the morning, we would walk over to the next square and have cafe con leche at Bar Santa Marina, which is another quaint little local spot. We also went another square over and had some drinks and tapas one night at Bodega Bar Umbrete, and a lunch one day at Abaceria Urbina...more great places nearby! Also this apartment is just a walk or taxi away from the amazing Seville Cathedral, and hanging out and enjoying Seville in the great Barrio Santa Cruz shops and restaurants. We loved our stay in Seville! Gorgeous View, Great Location, Loved it! We very much enjoyed our stay in the spacious, stylish, and comfortable penthouse with pool and private terrace in Seville. It would have been easy to hang out in the well-designed and attractively furnished and decorated apartment just relaxing and enjoying the views for much longer if we'd had a longer stay in Seville. As it was, with a bit of walking, we found the property to be nicely located to balance sight-seeing with restful breaks. The night we arrived, we walked just two plazas away and ended up at El Rinconcillo--reportedly the oldest bar in Seville and renowned now also for its excellent tapas. In the same plaza is another fine tapas establishment--Los Claveles. Once we got oriented to Seville, we realized we could easily walk to many of the major tourist areas--Barrio Santa Cruz, Plaza de Espana, the Cathedral, and Alcazar Real. After all that walking it was pleasure to return to the apartment to hang out on the terrace enjoying the sun and soaking our aching feet in the pool--which, in October, we found to be a little too cool for total immersion. Two improvements I would suggest--better lighting in the bathroom for applying makeup and provide a new map of town for the use of the renters. Oh, and we were not told where to drop the garbage off--so we ended up leaving it sorted by type in the apartment. Perhaps a map of the garbage site in a guide book for the property would have helped here. I would absolutely recommend this property to my family and friends--the generously-sized rooms could easily accommodate two couples or a family of three or four with older children. If I am ever fortunate enough to return to Seville, I will definitely stay here again. "Clean, peacefull appartment in a wondefull surrounding. The view from the terrase was super, even more then shown on the pictures. Beacause of the time of year (november) it was a little cold and there was a damp smell for the cuppord near the outer wall (just a minor thing)"
TRES JOLIE LOCATION. BIEN SITUEE. TOUT A PIEDS. LE PLUS : LA TERRASSE SUR LES TOITS DE SEVILLE AVEC L'EGLISE ILLUMINEE LE SOIR ! Parking facilities not included in the price. Indicative prices, subject to change. The final price is what gives the owner.